Thanksgiving Ideas and Resources to Gobble Up! Thanksgiving is an important event that teaches us about collaboration and acceptance between two vastly different cultures and this is definitely an important history our students can benefit from. Thanksgiving provides us the opportunity to teach students about what it means to be a good citizen and humanitarian. The Thanksgiving story helps students learn about the importance of celebrating and accepting our differences. Students can also learn important lessons about collaboration and gratitude. Below are various resources and lesson ideas to get your students to experience Thanksgiving in a whole new light. Feel free to download the slide presentation below and explore the bookmarks. Online Interactive Investigation of the History– Students act as history detectives and investigate what happened at the 1621 celebration by researching primary resources like letters and participating in online activities that show the different cultures and customs. Recommended books for story time- Twas the Night Before Thanksgiving, Today is Thanksgiving, The Pilgrim’s First Thanksgiving, and If You Were at the First Thanksgiving. You can find more about these titles and more here. Students can learn the story by participating in a play. After reading the history, put students in small groups and have them create their own scripts. You can also use these 2 prepared scripts. Young learners can create finger puppets and renact the story in small groups. You will find some finger puppet templates here. Students can retell the events to each other on a felt board. Here are some Thanksgiving felt board characters. Have students create digital stories! Story ideas include research a person who took part in the event and tell from their viewpoint, describe how they celebrate, tell a story about unlikely friendships, or foretell what life would be like if the Pilgrims and Wampanoag didn’t get along. Storybird is a free online storybook creator that has a great library of Thanksgiving characters to choose from! You can also create stories with Little Bird Tales and ToonDoo. Students can travel virtually to see Pilgrim and Wampanoag villages or travel on the Mayflower virtually. Students can read letters from a Pilgrim girl and Wampanoag boy. As an activity, they can write a response to one of the letters or they can take the series of letters and create an online scrapbook of the events with EduBuncee, BiteSlide, or Glogster. Students can view an online scrapbook of girl who made her voyage on the Mayflower. This virtual scrapbook from Scholastic is filled with online games, activities and more! In the past, I have had students go on nature hikes and we talked about how Native Americans used the land to create clothing, shelter, dyes, and for survival. We would collect leaves, rocks, etc. in plastic bags then create scrapbooks with descriptions. Students researched how each item would have been used by a Native American. You can do a digital version of this activity by having kids take pictures of the items then use EduBuncee, BiteSlide, or Glogster to create their nature books. Mr. Turkey Where Are You? is an ebook app for i-devices that was created by a mother for her son with autism. It has great features like reading the story aloud and the ability for students to upload their own images that appear in the story. Tom the Talking Turkey is a free app that allows students to speak to a turkey that repeats what they say in a funny voice. It also has recording and emailing options. 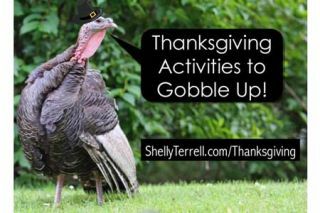 You can get your students to tell Thanksgiving jokes, chants, songs, poems or stories. You can also have students use the app to send a video of their blessings. With the Red Stamp app (web/iOS/Android) students can send free e-cards to friends or family members they want to thank. With the Thanksgiving Puzzle app (iOS/Android/Kindle), students can work on animated puzzles. Students can learn grammar by doing this Thanksgiving fill-in activity. It is like MadLibs. Have them break into pairs after and read their stories to each other. They can even create their own stories for other students to fill in using Google Forms. Motivate students to write with this Thanksgiving writing prompt. Students can play Thanksgiving Hangman. Here are various other Thanksgiving online games for kids.